We were looking at university costs in last week's Finance Fridays. This week we are looking at tipping. In the UK this can be a tricky subject. Who do you tip and how much? 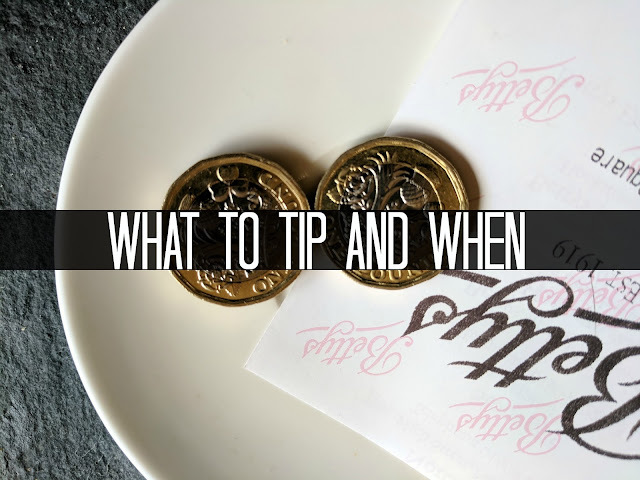 It can be a very personal thing but do you ever feel like you're being mean by not tipping or at risk of being a show off for leaving too big a tip? Let's have a look at what is generally accepted as services you should tip for and how much. Taxi drivers – If you hail a licensed metered taxi and the driver takes you quickly and efficiently to your destination then a tip of 10% will be appreciated. A prepaid fare usually won't warrant a tip. Hotel staff – We've all seen the American films where a pile of luggage is taken up to a hotel room and then a note is discretely pressed into the hand of the bellboy. Most of us have probably never been to a hotel posh enough in the UK that has such a service. If you are lucky enough to stay in such an establishment and you want to tip then do but unlike the US it is not expected. Hairdressers – This can depend if you are a regular customer or if you pop in twice a year. A regular customer may like to save up their tips to give in one go at Christmas. If you are a less frequent customer then a tip of 5%-10% would be appreciated. Tour guides and coach drivers – If you have gone on an organised trip then often at the end the tour guide will make a point of mentioning a tip bucket. This gives you the opportunity to empty for your change into the bucket but they probably won't appreciate a pile of coppers! Remember there are no set rules about tipping and being British this is one thing we often find difficult to deal with. If you don't think the service was up to scratch then don't leave one. Sometimes this is all the feedback that is needed about the service you have received. Do usually tip for services? How much would you leave as a tip? If you want to join in with this week's Finance Fridays then add your link to the linky below. Any post concerning financial matters is allowed. Full details here. It doesn't have to be published today as you have until 23.55 on Tuesday 5th September 2017 to join in.